Aiming a bigger role in the national political stage, the Trinamool Congress (TMC) preferred to opt for a 61-pointer party manifesto for the 2019 Lok Sabha elections to cover raging national issues as a whole rather than limit its reach only to West Bengal. Special emphasis has been given to jobs, women empowerment and political, economic & judicial reforms, besides several others. While the party has assured the voters to replicate its government’s success stories in West Bengal like Kanyashree (women and girl child empowerment programme), Sikhashree (scholarship programme) and other schemes at the national level, the TMC claimed to correct the alleged repeated mistakes of Goods and Services Tax (GST). 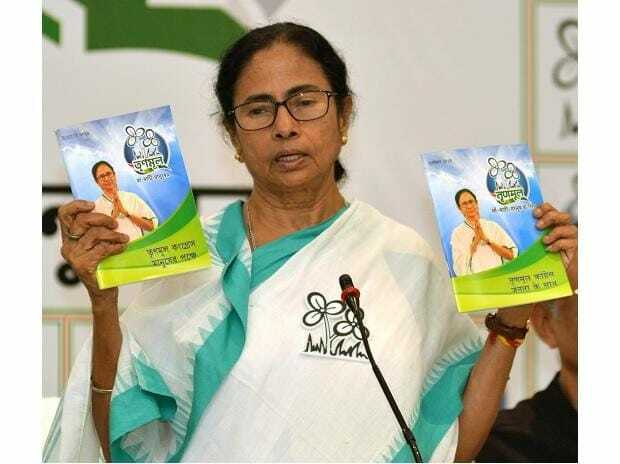 “Our experience will enlighten us to formulate policy at the all India level so that the SC, ST and OBC population can immensely benefit across the country”, the manifesto read, which was released by party supremo, Mamata Banerjee on Wednesday. Terming India to be in a state of economic crisis after demonetisation and the introduction of the GST, Banerjee said that if voted to power, the TMC will consult the best economists and other specialists to come up with an Economic Policy that will not only be limited to the growth of GDP from 7 per cent to 10 per cent, but will also specifically focus on generating employment. “We will work with all states to identify their individual core competencies and encourage them to focus on labour intensive sectors, many of which are also export oriented. In our model of growth with employment, we will focus on agriculture and allied industries as well as pertinent areas of manufacturing with high employment elasticities”, the manifesto said adding that while the party will encourage on development of cutting-edge digital technologies, it must benefit the basic needs like health, education and other areas of quality of life of the common people. “We must also remember that the purpose of adopting technology is to serve mankind and not create Frankensteins”, the manifesto said. A fresh foreign trade policy will also be created if TMC is voted to power. The manifesto also promised the voters of systemic judicial reforms to eliminate the backlog of accumulated cases in the country by focussing on Fast Track courts. It has proposed to set up exclusive Women’s Courts and deliver speedy justice and facilitate strong punishment for atrocities on women, minorities and the scheduled castes and tribes as its objective. While it also stresses on a Health for All programme to raise the health expenditure as a proportion of GDP at 4.5 per cent instead of the current 1.38 per cent, Banerjee also stated that her intention is to raise the expenditure on education from the current 3.24 per cent to six per cent of GDP. Banerjee also stressed that the ongoing problem in Kashmir can be solved and if needed she will volunteer to go there herself, understand people’s grievances and try to solve the problem amicably. The TMC supremo also promised several measures to improve the livelihood of the labourers, farmers, small entrepreneurs, armed personnel and others in the country as well as create labour friendly laws. During the release of the party’s manifesto, Banerjee attacked prime minister Narendra Modi accusing him of trying to influence voters and steal the credit from the country’s scientists for coming up with an anti-satellite missile. She feels Modi’s actions has flouted the model code of conduct as prescribed by the Election Commission. “What was the need of taking the credit for himself when the model code of conduct is in place? Is he going to space or a space walk? I congratulate the country’s scientists for their achievement and they should have told the public and not Modi”, she said. The TMC will write to the Election Commission on this as it feels it is a violation of neutral electoral proceedings. Another letter, accusing K.K. Sharma, the special central police observer for West Bengal and Jharkhand, of not maintaining impartiality as he was allegedly spotted of attending an RSS event, will also be sent to the Commission.